12 Drugs + 3 common urine adulterants *ONLY TEST CUP in U.S.A.
Drug Confirm™ Advanced Drug Test Cup detects 12 illicit drugs plus K2 and ETG Alcohol with 3 adulterants. 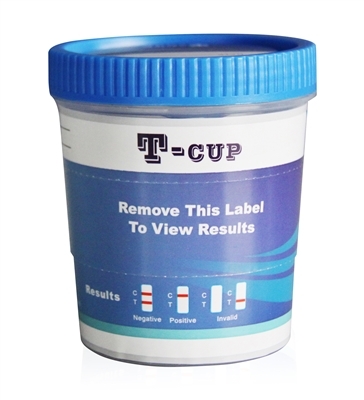 Drug Confirm 12 urine specimen cup is ideal for preemployment, random, post accident or on site drug testing and screening. Drug Confirm drug test cup is quick & easy. Testing for these drugs of abuse: Amphetamine, Cocaine, Opiate, Marijuana, Methamphetamine, Barbiturates, Benzodiazepines, Methadone, MDMA (Ecstasy), Buprenorphine, Oxycodone, ETG Alcohol & k2 synthetic spice mary j. Everything You Need In One Cup! The Drug Confirm urine k2 drug test cup is a high quality cup with a low cost. Its donor activated “one-step” design provides results in minutes and ease of use. Its small size results in low transportation costs and requires minimal storage. Drug Confirm cup includes security seals for gc/ms/lc lab confirmations. Drugconfirm cup is very easy to read, simply peel label back to reveal instant readings. Negatives in about one minute, positives in just 5 minutes. Tests arrived quickly. Initial fumble sending wrong product but immediate recovery. Corresponding emails prompt. Grateful for the efficiency.